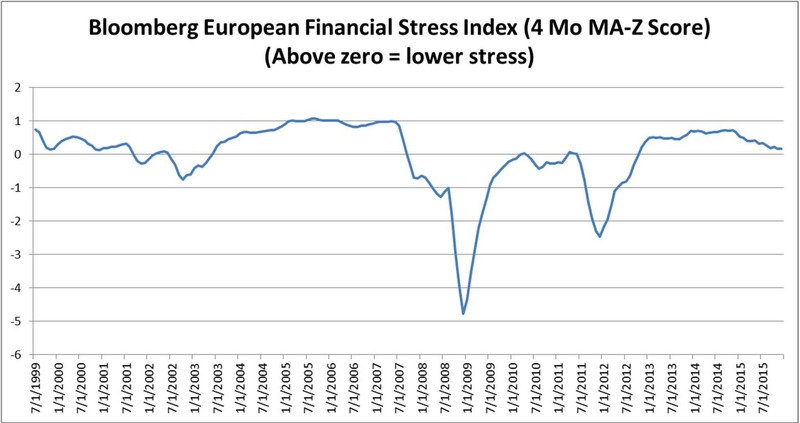 In reality, the risk of recession and the level of financial stress in the system remain low. 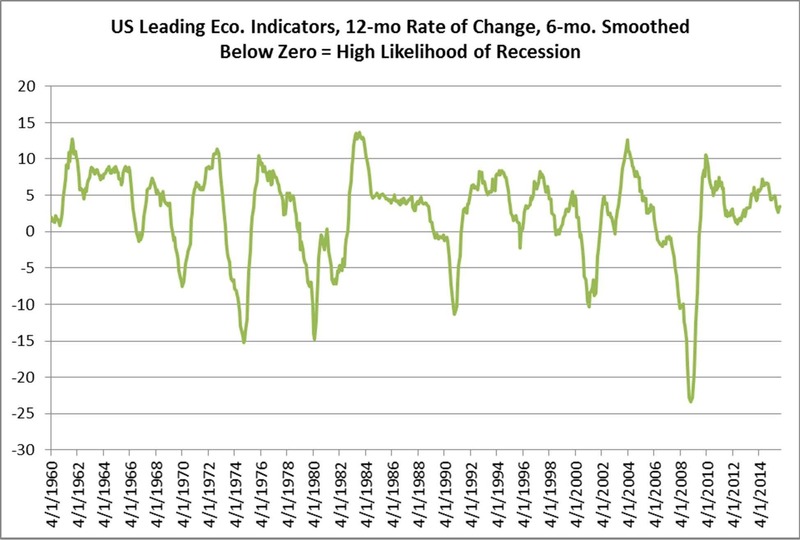 First, let’s look at a rate of change chart based upon the Conference Board’s US Leading Economic Indicators. 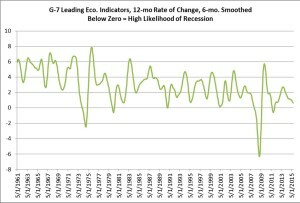 Thrusts downward through the zero line in the chart are indicative of extremely high recession risk. 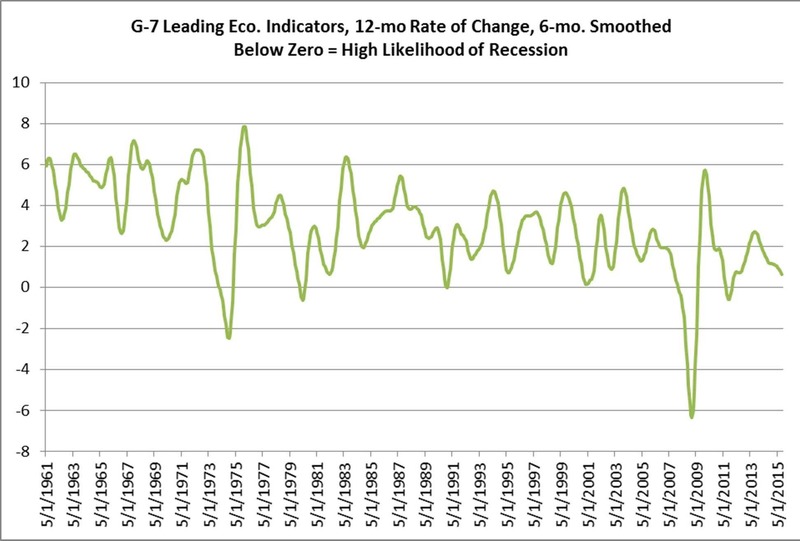 As you can see below, with the latest number updated last week for the month of November, the series remains well above the zero line in low-recession-probability territory. Furthermore, and important for those looking at the intermediate term risk outlook in markets, a look back to the beginning of the chart in 1960 shows no major equity bear market has begun without this chart-line having fallen below the zero line. In essentially all cases, moves downward through the zero line in this chart preceded major bear market moves by several months. This makes sense. As we’ve discussed in the past, economic recession provides the key ingredient separating a run of the mill correction from a harrowing bear market. 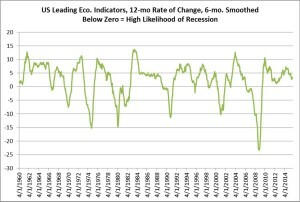 If you wait for official recession signs, it’s too late. The LEIs actually perform a solid job of signaling major economic distress several months ahead of time. Again, right now LEIs appear to indicate that economic upheaval isn’t in the cards at this point. Second, let’s look at our chart measuring financial sector risk in the US. Our financial market plumbing risk indicator is based on several different Federal Reserve bank financial system risk composites, such as the St. Louis Fed Financial Stress Index, and the Chicago Fed National Financial Conditions Index, which themselves capture dozens if not hundreds of market financial system indicators. 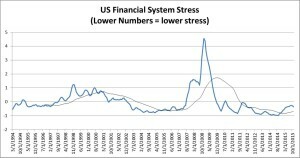 As you can see below, financial system stresses have increased relative to levels seen during the summer of 2014, which happened to be the lowest ever observed in the series, but well below the zero line which marks the point at which financial system stresses are becoming a significant problem. Bottom line, the broader financial plumbing, even taking the high yield spike into consideration, is in reasonably good shape at this point. This is good news. 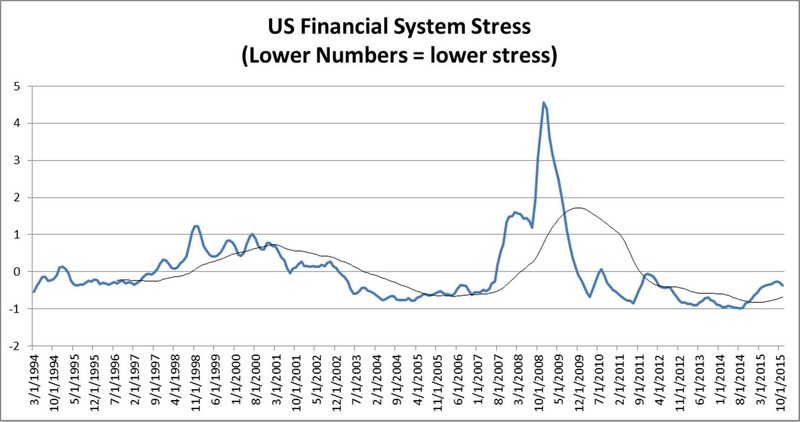 Over the past 20 years, the two major bear markets have been preceded by significant upward spikes in financial stress. At this point we’re far from experiencing these conditions. What about the rest of the developed world? A similar story exists. 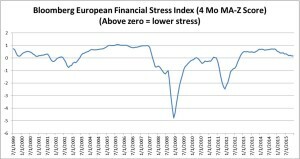 Recession risk remains low at this point (though the chart does capture the unremarkable global growth situation) and financial system is risk is contained. What to make of all this? Corrections come and go. Maybe 2016 will be another frustrating, choppy year like the past two. We obviously can’t say for certain. All in all, though, we still believe the risk of a nasty coordinated global recession remains low over the next several quarters. And, we believe that the any associated risk of a major equity market calamity remains low at this point too. There’s been plenty of fear-mongering over the past several years. Yet, markets move ahead or hold their ground. In our assessment, the fear-mongers will have to continue their wait.